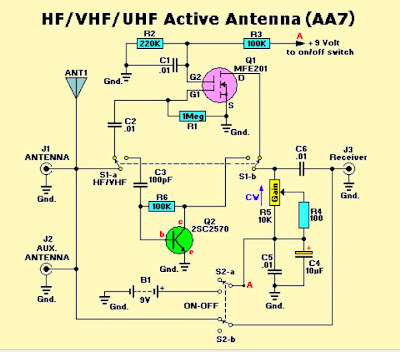 If you have a shortwave or high-frequency receiver or scanner that is struggling to capture signals with a short, whip antenna, and you'd like the kind of performance that a 60-foot 'longwire' antenna can provide but lack the space to put one up, consider building the AA-7 HF/VHF/UHF Active Antenna described in this article. The AA-7 is a relatively simple antenna that is designed to amplify signals from 3 to 3000 MegaHertz, including three recognized ranges: 3-30Mhz high-frequency (HF) signals; 3-300Mhz very-high frequency (VHF) signals; 300-3000MHz ultra-high (UHF) frequency signals. Those bands are typically occupied by shortwave, ham, government, and commercial radio signals. In its simplest form, an active antenna uses a small whip antenna that feeds incoming RF to a pre-amplifier, whose output is then connected to the antenna input of a receiver. Unless specifically designed otherwise, all active antennas are intended for receive-only operation, and thus should not be used with transceivers; transmitting into an active antenna will probably destroy its active components. A well designed broadband active antenna consider field strength of the desired signal (measured in microvolts per meter of antenna length), atmospheric and other noise, diameter of the antenna, radiation resistance, and antenna reactance at various frequencies, plus the efficiency and noise figure of the amplifier circuit itself. Figure shows the schematic diagram of the AA-7, which contains only two active elements; Q1 (an MFE201 N-Channel dual-gate MOSFET) and Q2 (a 2SC2570 NPN VHF silicon transistor). Those transistors provide the basis of two independent, switchable RF pre-amplifiers. Two double-pole double-throw (DPDT) switches play a major role in this operation of the AA-7. Switch S1 is used to select one of the two pre-amplifier circuits (either HF or VHF/UHF). Switch 2 is used to turn off the power to the circuit, while coupling the incoming RF directly to the input of the receiver. That gives the receiver non-amplified access to the auxiliary antenna jack, at J1, as well as the on-board telescoping whip antenna. With switch S2 in its power-on position, the input and output jacks are disconnected and B1 (a 9 volt battery) is connected to the circuit. With switch S1 in the position shown in the schematic, incoming RF is directed to the HF pre-amp circuit built around Q1 (an MFE201 N-Channel dual-gate MOSFET). The HF pre-amp operates with an exceptionally low noise level, and is ideal for copying weak CW and singe-side band signals. When S1 is switched to the other position, the captured signal is coupled to the VHF/UHF pre-amp built around Q2 (a 2SC2570 NPN VHF silicon transistor), which has excellent VHF through microwave characteristics. With the on-board whip antenna adjustable to resonance through much of the VHF-UHF region (length in feet = 234 divide by the frequency in MHz), the VHF/UHF mode is ideal for indoor and portable use with VHF scanners and other receivers. Either mode can be used when tuning 3-30 MHz HF signals. The VHF/UHF pre-amp offers higher gain than the HF pre-amp, but also has a higher noise level. You can easily choose either amplifier for copying any signal; of interest--just try both positions. The RF gain control (R5) can be used to trim the output of either amplifier. Caution: The AA-7 is not intended for transmitting operation (be it Ham, Maritime, or CB); if it is used with a transceiver of any kind, make sure it is not possible to transmit by accidentally pressing a mike button or CW keyer. Transmitting RF into the AA-7 is likely to ruin one or both of the transistors in the circuit.